Look at where the arrow points. That's a blade part that extends from the handle orthogonal to the knife axis and it's pretty thin and its side actually continues into a very sharp blade edge. My concern is the following. Suppose I need to cut a chicken carcass. I will want to stick the knife deep and then start cutting. What if while I'm sticking the knife my hand slips along the handle onto that edge pointed to by the arrow? I expect an epic cut should that happen so I've been avoiding such knife design for years and always preferred knifes where there's a piece of plastic extending from the handle in from of that blade edge (kind of hilt or guard). Maybe I'm just overly paranoid about this. Is there real risk of having a cut while cutting food in the scenario I described? No, there is not a risk to getting the kind of cut you describe, as long as you treat your knife with the respect it deserves. If there's a dull, raised part at the back of the knife, it is called the bolster, otherwise it's the heel of the blade. The raised version is a common trait in forged knifes, and is supposed to add strength to the blade. From experience: yes, you can cut yourself on the heel of bolster-less knifes, but generally not in the way you describe. I would not avoid them, or avoid knives where the blade tapers from the handle for safety reasons. I've cut myself a couple times on the heel of the blade when grabbing for a knife in a hurry, but these kinds of cuts are generally superficial and fast healing. There is also a significant advantage to bolster-less blades: they're much easier to sharpen, and have more usable length to the blade. The knife in the picture is a paring knife. The way to use such a knife is completely different from what you pretend (cutting a carcass). 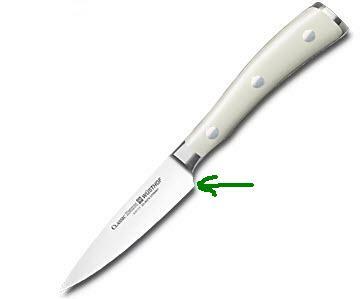 A paring knife is used with the sharp end facing you and pushing the small food items across. For cutting a carcass, I'd recommend a regular chef's knife, a Chinese knife or, preferably, a cleaver. It depends on what I am actually doing with the knife. I would indeed not use a knife like this for work requiring some force. Slicing tomatoes is one thing, but image that you actually cut a chicken with that knife and in a forward motion with some force hit e.g. a bone. There is a definitive risk, that your finger will slip over the ridge and slide along the blade. Not the answer you're looking for? Browse other questions tagged knives cutting knife-safety or ask your own question.